HSE Guidance is available for the requirements on guarding on horizontal boring machines (HSE Engineering Sheet No28 –Safeguarding at horizontal boring machines). This details how to install horizontal boring machine guards to reduce the risk of accidents. 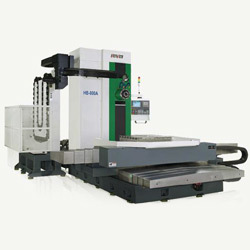 It applies to both CNC and manual controlled machines of all sizes and configurations. The approach to the extent of guarding heavily relies upon a rigorous risk assessment. Best practice for horizontal boring machine guards is to fit a perimeter fence at a height meeting current height & reach regulations, together will interlocked access / loading doors that prevent the machine from operating when they are open. There is provision for a “hold to run” control and/or key operated setting switch to temporarily override the interlock system during setting, if there is a need for the machine to operate for setting purposes. This however needs strict controls and use of predetermined written safe working procedures. The key must not be left in the override switch. If physical guarding is not practical, alternative types of safety devices may be used, eg light curtains or pressure sensitive mats. If this is the case then the risk assessment will need to clearly demonstrate why a full interlocked enclosure is not practical. Solon Systems has successfully supplied and fitted horizontal boring machine guards and safety systems to numerous CNC & manually controlled horizontal boring machines to meet PUWER 98 regulations. Solon Systems will design & manufacture the safety systems. Solon Systems provides a full mechanical/electrical installation service. This includes electrical surveys of the machines to ensure that the interlocking systems can be wired into the horizontal boring machines independent low voltage safety circuit to meet current regulations. This is carried out by a qualified Electrical Engineer. Contact Solon Systems at sales@solonsystems.co.uk and our Specialist will be in touch with you directly. Why Solon Systems for Horizontal Boring Machine Guards?